Very large alligator skull, cleaned and bleached. Great specimen for any cabinet of curiosities or curio collector. (20" long). Beautiful crystal snail or escargot from Daum. Daum is a crystal studio based in Nancy, France, founded in 1878 by Jean Daum. Cast bronze skull. Approximately 10 pounds; heavy enough to be used as a book end or large paperweight in library or office. Pictured with bronze skull with silver patina. 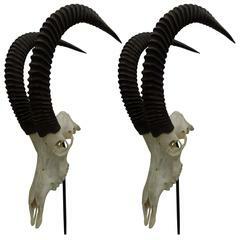 African Gnu skull can be wall-mounted or rest on a table top. 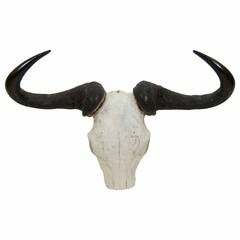 Beautiful large authentic buffalo or steer bone skull with horns from New Mexico. Metalized skull of a warthog. 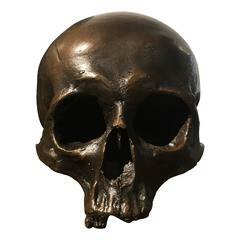 The skull is provided with a real metal layer which has been corroded making it a beautiful patina. The skull is mounted on a high quality pedestal. 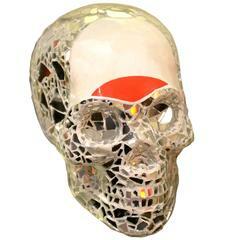 Sculpture artist proof skull vanity. Numbered limited edition: 16/30. 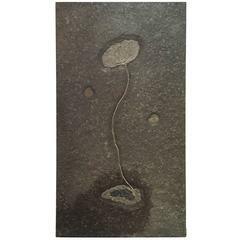 Materials: Cement, pigments and mirrors. We can provide the cites documents for this article. A camel skull on mahogany mount.